For any questions regarding our RF Connectors & Cables, you are always most welcome to contact us. In addition, you might already find an helpful answer by clicking one of the questions below. 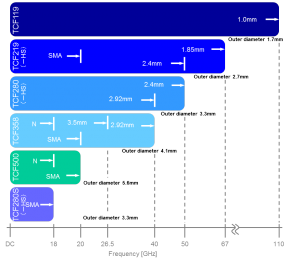 Below you will find the interface mating dimensions of different KMCO RF connectors. Whether a high quality male and female connector can mate together without any mechanical harm depends on the dimensions c, d, e, f, g and the thread type. 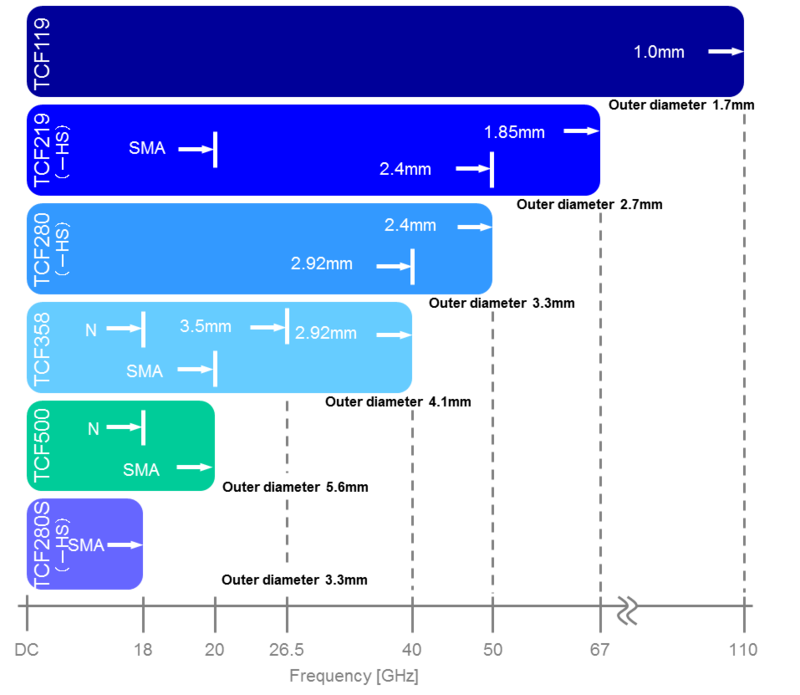 The table below shows IEEE-std-287 RF connector standards. The combinations with a check mark share the same specifications for the dimensions c, d, e, f, g and the thread type. Thus, these are mechanically compatible. Although mechanically compatible, the different interfaces still have different dimensions of the inner and outer connector (the dimensions a and b). Mechanically, this means that a conductor with a larger diameter connects with a smaller diameter conductor. The junction is not as smooth as if two connectors of the same type would mate. This “impurity” does influence the electrical performance. However, practically this influence is very small. In particular for data signals it is not noticeable. IEEE-std-287 defines the interface names according to the inner diameter of the outer conductor (dimension b). Some manufactures, however, designate parts with their own names. These are not different connector standards; just different names. Thus they mate perfectly. The list below shows which designations are essentially referring to the same interface. Can I work beyond the specified bandwidth or even cut-off frequency? The term cut-off frequency originally comes from wave guides. A wave guide structure has a low frequency cut-off, guiding the wave at frequencies above the cut-off with minimal loss. The waveguide doesn’t need an inner conductor. The basic performance of an RF and microwave coaxial cable is determined by the connector diameters. At low frequencies, electrical signals propagate in coaxial lines in the TEM (Transversal Electro Magnetic) mode. If the frequency of a signal into a coaxial line is chosen too high waveguide modes of the electromagnetic field (such as the H11) may exist. To ensure that only the TEM mode propagates, thus keeping the signal clean, the frequency needs to stay below the cut-off frequency fc. The cut-off frequency is not exactly the same as the specified upper frequency limit. In fact, the standards leave some margin as shown below. The characteristic for the onset of the 1st moding frequency is the occurrence of a null (a drop in signal) in the frequency transfer characteristic. If the application is for broadband communication signals (i.e. PRBS or similar type of data) the impact of this first frequency null might be negligible. In fact, in case a cable with a lower cut-off frequency is chosen, one may not suffer from the potential moding, but benefit from less attenuation due to the bigger diameter. However, the first mode is potentially damaging the signal if the system is supposed to transmit narrowband RF signals at or around the moding regime. Is it always the best to use the cable with the highest cut-off frequency? So, in particular for longer cables one might consider sacrificing bandwidth to minimize over-all loss of the transmission path. For example, SHF delivers its 64 Gbps Bit Pattern Generators with 2.40 mm cable assemblies although a cable with 1.85 mm connectors might provide more bandwidths. What is the attenuation (insertion loss) of a Totoku cable? Please select the lengths, the connectors and the frequency you want to operate at and the calculator below will show all fitting Totoku cable assemblies together with the typical and guaranteed maximum insertion loss S21. In case a cable with two different connector interfaces shall be calculated, please just select the connector with the lower bandwidth. Please enter a positive frequency. The frequency you selected exceeds the maximum frequency of the chosen connector (	GHz)! Some connectors are available with different cables. Which cable shall I choose? In a nutshell, if there are different cables which can be equipped with the same connector: always choose the cable with the bigger diameter (simply because the bigger diameter results in less attenuation). The Totoku cable line up below shows that some connectors can be attached to different cables. If above rule always applies, why would one do that? Because a cable can be equipped with two different connectors (like an adapter). The TCF280, for example, can be equipped with a 2.92 mm on one end and a 2.40 mm on the other end. Bearing in mind that such a combination results in the attenuation of a 2.40 mm cable while providing only the bandwidth of a 2.92 mm connector, such a cable can perfectly be used to omit an adapter. Because mechanical restrictions in the setup restrict the use of a bigger diameter cable. Other than that, there is no reason to choose the thinner cable.